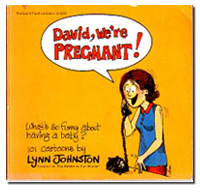 For almost 30 years, I produced a comic strip that practically opened my front door and invited everyone into my living room. I received letters from all over the world, from readers who said I was talking about their life, that I was like the woman next door– a friend they could relax with and confide in. This was both an incredible compliment, and an anchor that kept me focused and real. If I may, I’d like to ask my readers to allow another neighbour into their homes. 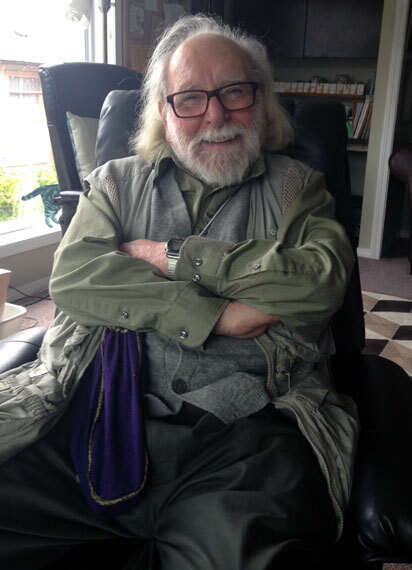 Here is a writer who has done much, much more. 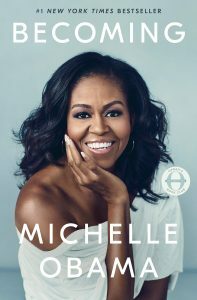 I urge everyone to read Michelle Obama’s book “Becoming.” I think it is one of the most important pieces of literature to come out of the United States or anywhere– because it humanizes all of us. At a time of fake news and cruel, unwarranted attacks from far left and far right, Michelle Obama speaks from the center; from the heart and from a place of normalcy. Inside all of us is a centered place where we feel balance and strength and a sense of belonging. The wonderful song: “We Are The World” comes from this place. With honesty, perspective, and woman-to-woman candor, she speaks to everyone — without arrogance, reticence or guile. She is an excellent writer who takes you on a most intimate journey. I don’t want to write a review. I want everyone out there to review it themselves. I have a bit more to read before I put this book in a safe but prominent place. I don’t want it to end. It’s THAT good. This entry was posted in Letters from Lynn on January 7, 2019 by fborfwnews. The last week of August saw me heading north. 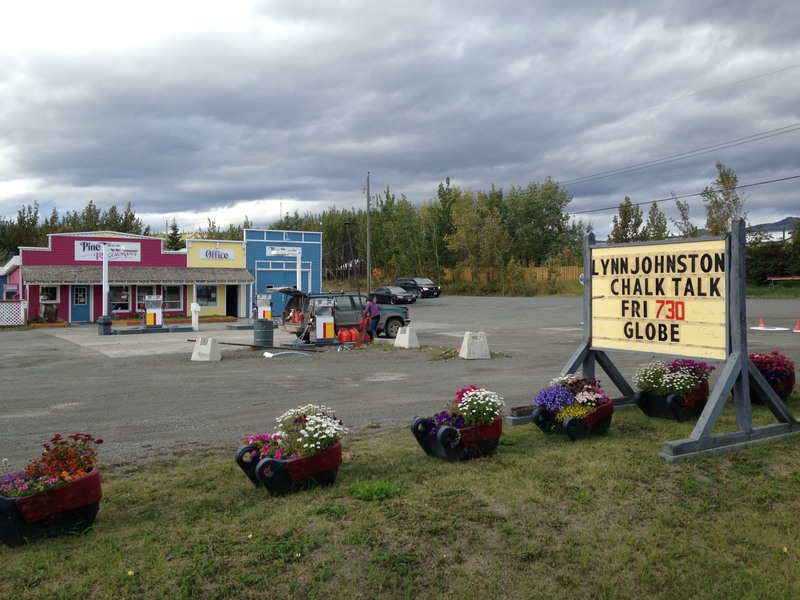 I had agreed to do a “chalk talk” at the tiny Globe theatre in Atlin, BC – just south of the Yukon border. The flight to Whitehorse on Air North was pleasant as always – one of the few airlines which treats passengers with courtesy and appreciation. There is no charge for checked luggage, you get a nice lunch and at the end of the trip, they bring you a warm chocolate chip cookie! I always sit in a window seat. 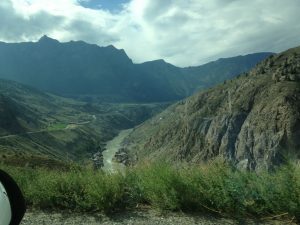 The scenery along the B.C. coast is spectacular and must be seen from above if possible. 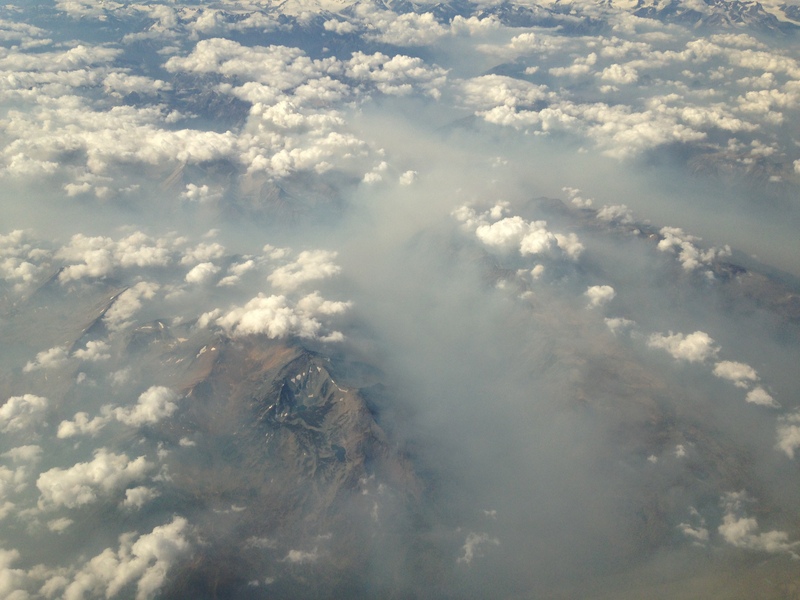 Forest fires were raging again, and the result could be seen from 30 thousand feet above the ground. I took some pictures to show that smoke filled the valleys. It came up to the mountain crests. No wonder people were evacuating to safer and clearer areas; the air was bad. Paul (my partner) picked me up at the airport. It was a cool, clear day and compared to the dry heat of the city, it felt like fall. After a fast trip to Skagway to see friends, we returned to Atlin and Paul’s tiny log cabin. It’s a cozy space nestled in the woods. He built it by hand when he was in his 20s and he says the land is in his DNA. I love being back in the north. When I was a kid and just leaving home, I wanted to stay in the city, be an animator or go into advertising. Like all city kids, I thought the north and the prairies were off the map; no place for me. 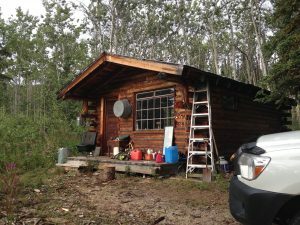 Later, when fate took my family and me to Lynn Lake Manitoba, I changed. Small towns connect you to what’s real; what’s important. You learn to do without, to create your own entertainment, to be resourceful and to depend on your friends and family. Atlin is one of these special places and it comes with scenery too beautiful to photograph. Maybe that’s why so many talented artists choose to live there. 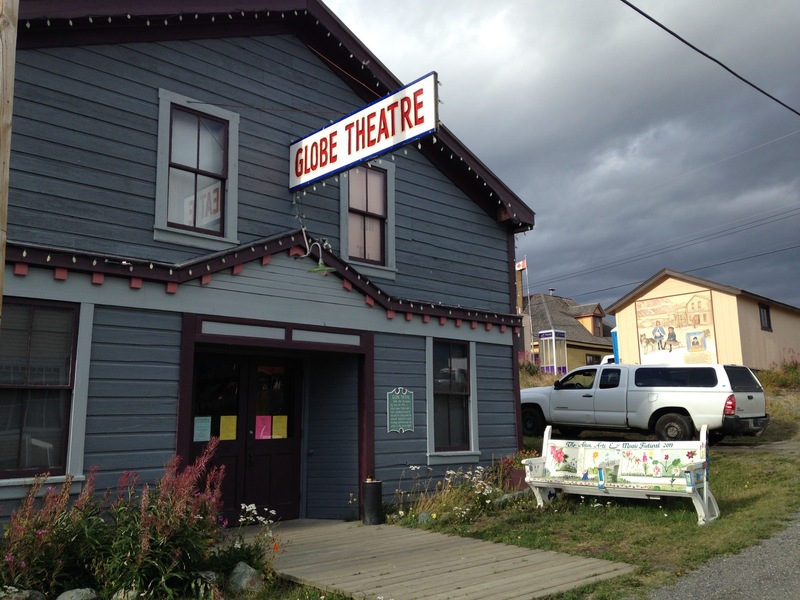 The Globe theatre, on Atlin’s main drag, was built during the Gold Rush. It has been beautifully restored and seats about 100 people. Heather, the Globe’s young and enterprising operator, had arranged a number of fundraisers in order to pay for the boiler which has to be repaired before the long winter sets in. Paul and I were the last of the “shows” and 23 people showed up. It was like a reunion as everyone knew everyone else. Heather set the heater in the middle of the aisle to heat the place up a bit, then put on the coffee and the popcorn. She had also made Rice Krispie squares. We had an hour and a half to perform, as there was a baseball game on as well – an inter-community game which was a serious draw! Paul “opened” for me, with a few numbers on his guitar. He is a local favourite and I asked him to play something he’d never played for an audience before. I figured – if he’d roped me into this, I was going to give him a challenge in return! He played some fine original tunes – which I had only heard in part. This shows the board in front of the Atlin Gas station, advertising the show. I told Heather that what I did was called a “chalk talk” and wondered how many folks would know what that meant! Not many, I’m sure – but there it was! The chalk talk always goes well and is never the same twice. 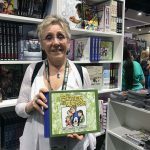 I talk about the things that go into a cartoonist’s mental rolodex: childhood memories, personal truths and lifetime adventures I want to share. I draw while I talk, using an overhead projector – a machine which is becoming harder and harder to find! 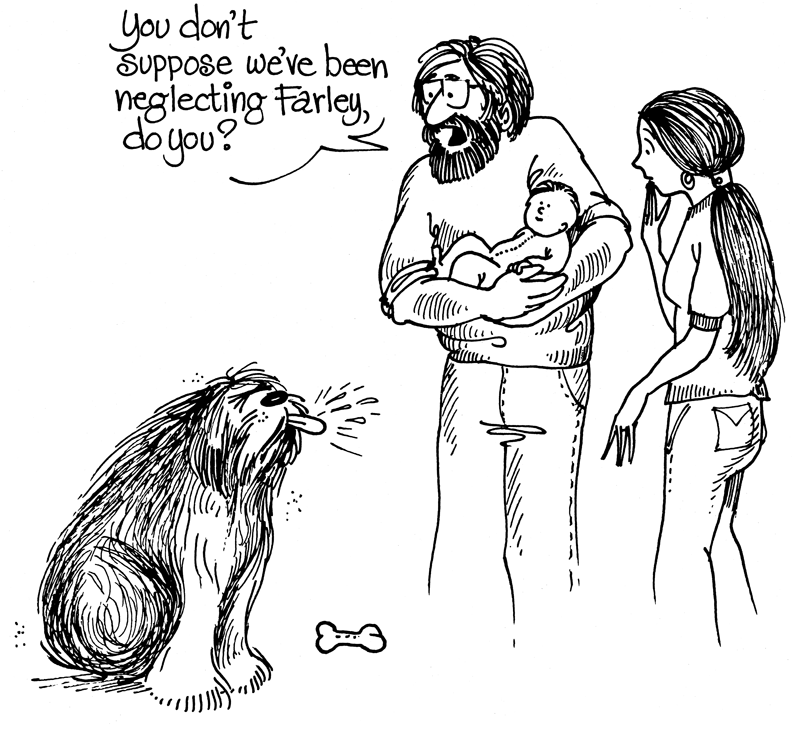 I have always loved to watch my cartoonist friends draw. It’s a magical experience. With this in mind, I use the projector to illustrate my talks and it has become more than a tool, it’s kind of a “Dumbo’s Feather”. I need it to hide behind and give me the confidence I need to do public speaking! I’m still an amateur. I have learned that stand up comedy is the hardest job in the world and I’m awed by the people who do it well! After the talk and some more visiting, Paul and I left the Yukon and began the long drive home. Every year, he likes to bring his truck back to Tsawassen where he has a cottage. I have begun to look forward to this four-day journey – for the scenery and for the experience. I love a good road trip! There were fewer fires. Firefighters and some much-needed rain had lessened the threat and the smoke had dissipated. We were able to see the great walls of rock, vast mountain meadows and deep winding gorges of B.C’s interior highways. We listened to “books on tape” and enjoyed staying in out-of-the-way hotels and cabins. I didn’t want the trip to end. This entry was posted in Letters from Lynn and tagged talk, travel on September 21, 2018 by Jelly Marketing. 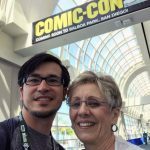 I have just returned from Comic Con in San Diego. I was invited to be a speaker this year, and to sit on a couple of panels. It was great to play the role of cartoonist again! Even though I continue to draw and create funny designs and patterns, I miss spending time with friends who are still doing the dailies and Sundays; still working to deadline. I miss being one of them! Having said that, I don’t wish to return to the work I did for so long. The fact that FBorFW is still remembered so fondly fills me up and makes me proud of the work I’ve done. It’s a great feeling. The first time I went to this unconventional convention, it was a relatively small gathering of cartoonists who wanted to share their work, have their folios reviewed, buy and sell stuff, and drink beer. We all walked from table to table, enjoying new ideas, seeing how artists drew and coloured — all before the magic of computers. This was magic on its own! You could see the entire exhibition floor in less than a day and I don’t remember anyone wearing costumes. Today, the “Con” attracts tens of thousands. There is no age limit. Everyone, from the new kid in a carrier, to granny with a cane, is there– along with hordes of twenty-somethings who line up for hours, some sleeping on sidewalks in the hopes of scoring tickets to an event, a talk, or a workshop. People are friendly. People are reunited, and new friends are made. It is a seething, bustling, colourful crush of fans and foragers. Many people come in costume, looking for headgear and hardware, buying everything from space suits to makeup — whatever it takes to become a superhero. Whatever you can dream up, you can be. The convention hall is shaped like a massive cruise ship. 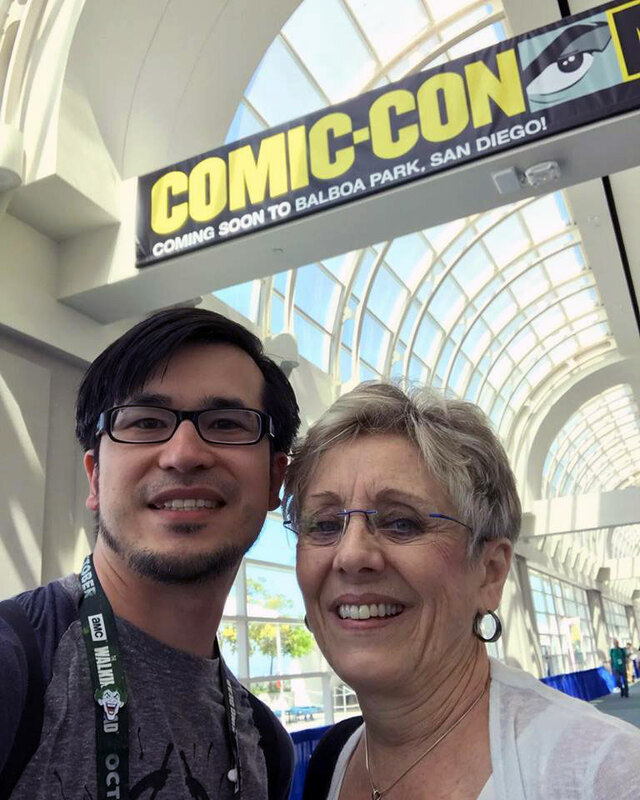 Each day it took at least half an hour to work my way through the comic book stands, graphic novels, animation exhibits, and original art to wherever I needed to go. Fortunately, I had a volunteer guide who took me directly to meeting rooms and signing tables or I’d have been lost! Everywhere, I was greeted by folks who read my work as children and were now reading it to kids of their own. They would appear and then dissolve again into the dense river of people. 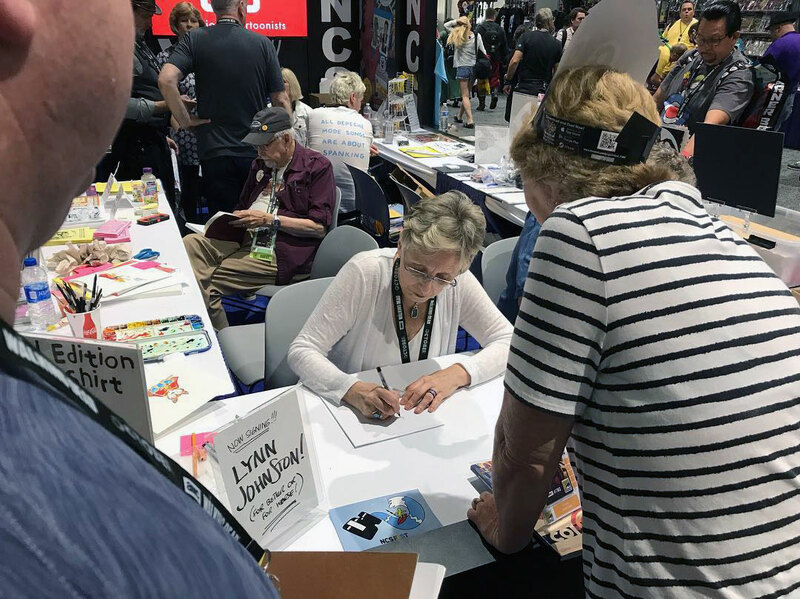 I was grateful to sit in the National Cartoonists Society booth with Greg Evans, Maria Schriver, Steve McGarry and crew, safe and out of the way. 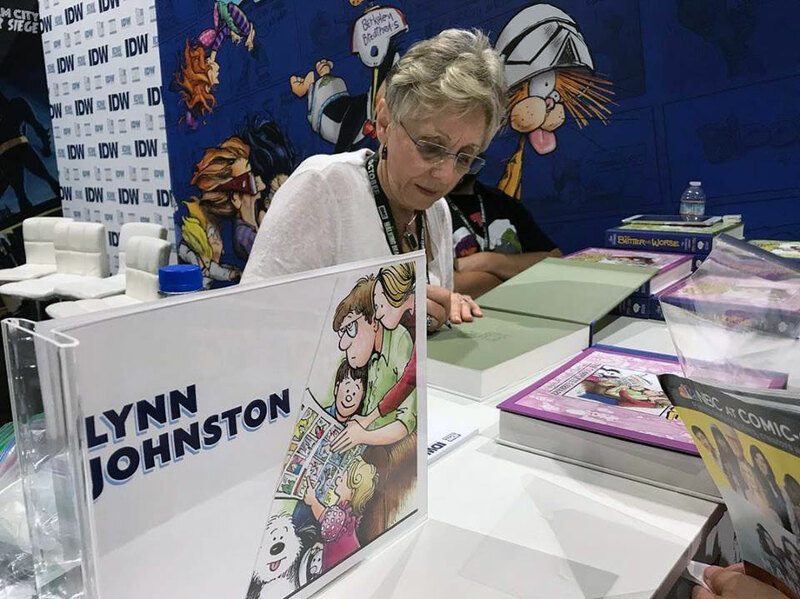 I also spent time behind the desk at IDW publishing, signing the new collection books. Having somewhere to be, somewhere to stand, made the massive crowd easier to manage. Moving bumper to bumper with aliens, robots, rubber chickens, and the undead, is wonderful — but in small doses. 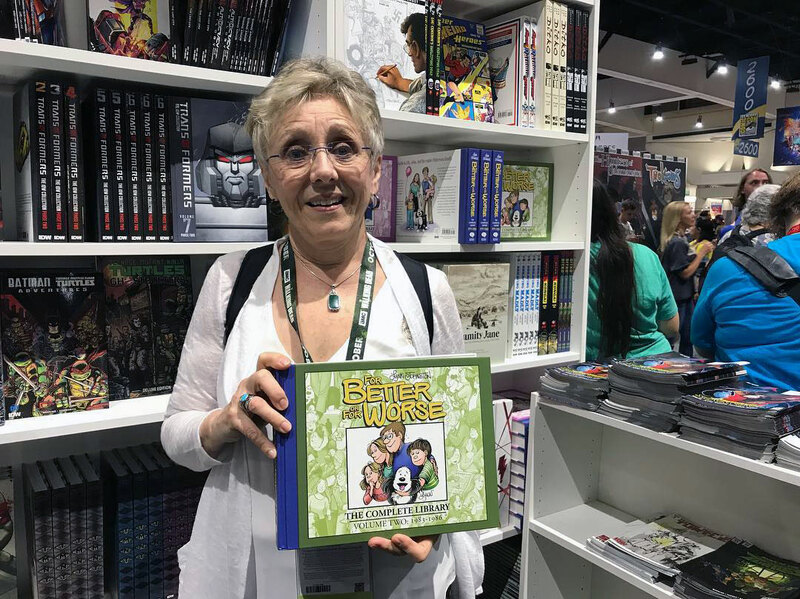 Lynn holds a copy of her new treasury book. 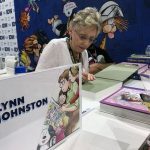 Lynn at one of many book signings. 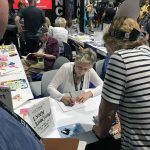 Signing copies of her books. It’s over for another year. I’m home again, looking at photos and sending messages to folks I met. 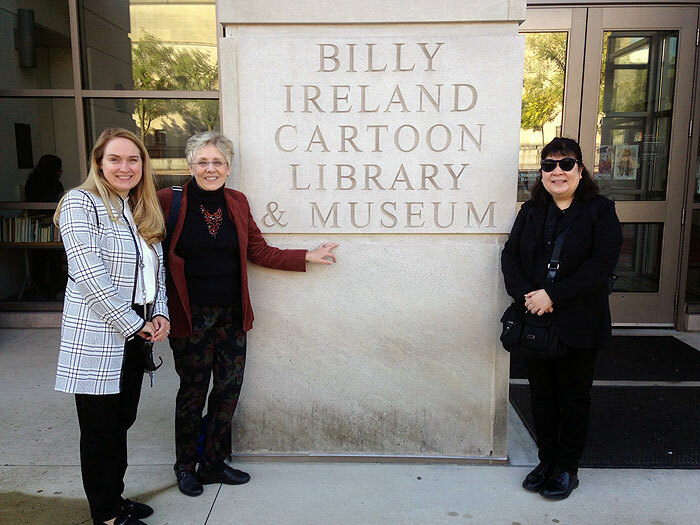 It was four days of fun and freedom; of harmless fantasy in a celebration of comic art at its best. At a time when the world outside seems stark raving mad, I’m grateful for the kind of craziness that brings people together in spirit and solidarity. That’s Comic Con. This entry was posted in Letters from Lynn and tagged san diego comic con on August 9, 2018 by fborfwnews.